PennsylvAsia: English/Korean Language Social Hour September 13 at Pitt. English/Korean Language Social Hour September 13 at Pitt. 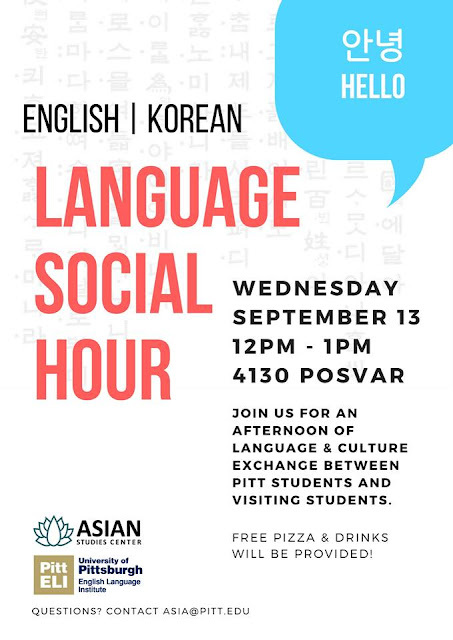 The University of Pittsburgh's Asian Studies Center and the English Language Institute will present an English/Korean Language Social Hour on September 13, as a way to bring together Korean ESL students and Pitt students learning Korean. It runs from 12:00 to 1:00 pm in 4130 Posvar Hall (map), and will feature ELI students from Chosun University (조선대학교) in Gwangju, South Korea. Refreshments will be provided, and the Social Hour is free and open to the public.